Get an enhanced 80/1 acca on Bayern, Barcelona, PSG and Man UTD all to win their Champions League fixture tonight with Betfair (was 7/1). New customers will also receive £100 in free bets as welcome bonus! Looking for the highest paid accumulator on Wednesday's Champions League matches? 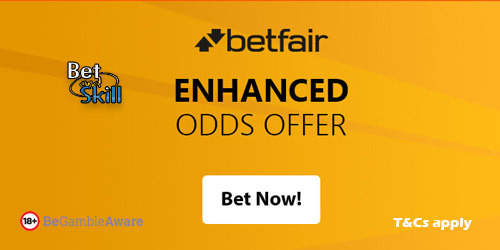 Betfair are upping the nate by offering a crazy boosted acca! Get 80/1 on Barcelona, Bayern, Man UTD and PSG all to win tonight! It would normally pay 7/1! Find below how to take advantage of this 80/1 enhanced accumulator! Place your first bet (max £/€10) on the accumulator by taking the normal prices on Betfair site. Place a bet on Barcelona, Bayern, PSG & Man Utd all to win in the 'New Customer' market at the enhanced price on the Sportsbook. Max stake £1. "Get 80/1 Barcelona, Bayern, PSG and Man UTD all to win tonight (Betfair Enhanced Acca)"